Did you know that Ford of Canada was the first Canadian car company to build a complete automobile from Canadian parts in 1913 – from nuts and bolts, all the way to the finished product? Although this did not occur at the Oakville factory as the assembly plant had not yet been established, this paved the way for growth within the industry, promoting Ford to expand to Oakville. In 1922, 70% of the cars seen on the road carried the signature Ford name and in World War II, Ford of Canada assembled more than 50% of the military vehicles used by Canadian soldiers. When Ford of Canada first purchased 410 acres of land in Oakville for the development of a new assembly plant, many concerns arose for the small town. Written in the Hamilton Spectator, Bruce Murdoch noted that, "With the recent announcement that the Ford Motor Company of Canada is to build a huge assembly plant in the township, a short distance from the present town limits, it is freely predicted that Oakville is bound to become a city of twenty to twenty-five thousand population in the not-far-distant future" (1951). 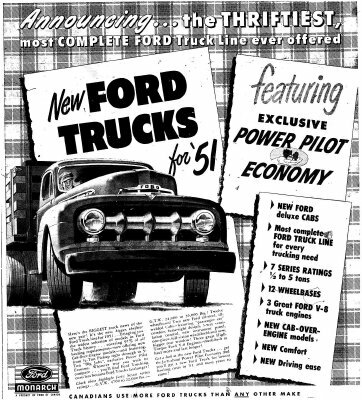 In 1953, the Oakville Ford Plant was officially opened. In spite of their concerns Oakville residents soon learned that the Ford factory only further expanded Oakville’s industries, bringing new businesses that were needed to supply and service the Ford automobile products. 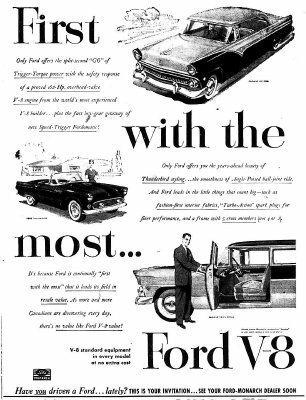 On May 11, 1953, the first brand new car rolled off the assembly line at the Oakville Ford Plant, the 2,794,525th automobile built by Ford Motor Company of Canada. The opening of this factory truly brought about a significant amount of expansion for the quaint town of Oakville. Approximately 80% of Ford’s employees came from outside of Oakville, bringing newcomers into the small community. At one point in time, Ford employed almost 5,700 workers! The Oakville plant is one of the largest industrialized buildings under a single roof in the British Commonwealth – the entire factory covers a total of 32.5 acres. The Ford assembly factory truly did turn Oakville into a bustling town, expanding the business industry and bringing about new jobs for the community. Not only did the Ford name boost the reputation of the town, Oakville also skyrocketed on Bell Telephone's radar, becoming a priority for the new dial system. Still popular today, the Ford Motor Company of Canada is the oldest automobile manufacturer in Canada and the Oakville assembly plant is still in full use. Information credited to: McKeon, Clare and Joseph P. McKeon. Oakville, A place of some importance. Burlington, Ont. : Windsor Publications, 1986. Print. and to: Murdoch, Bruce. "Oakville is on Eve of Boom Days." The Hamilton Spectator 10 Nov. 1951: 2. Print. 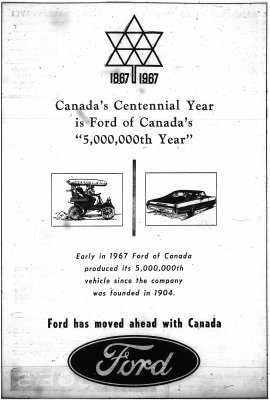 and to: Ford: 100 Years in Canada. Collector’s Edition. Oakville, Ont. : Formula Media Group, 2004. Print. Quotation credited to: McKeon, Clare and Joseph P. McKeon. Oakville, A place of some importance. Burlington, Ont. : Windsor Publications, 1986. Print. Virtual exhibit created by Emily Vickruck, 2012. Oakville Images is a partnership of the Oakville Public Library, Oakville Historical Society, Oakville Museum at Erchless Estate, the Town of Oakville, HALINET,Appleby College, Bronte Historical Society, Trafalgar Township Historical Society and Private Collections.